Singapore is one of the top places to maximize your chances to get highly paid jobs. In order to get Jobs in Singapore, One should look for Singapore job requirements from various multi-national companies. 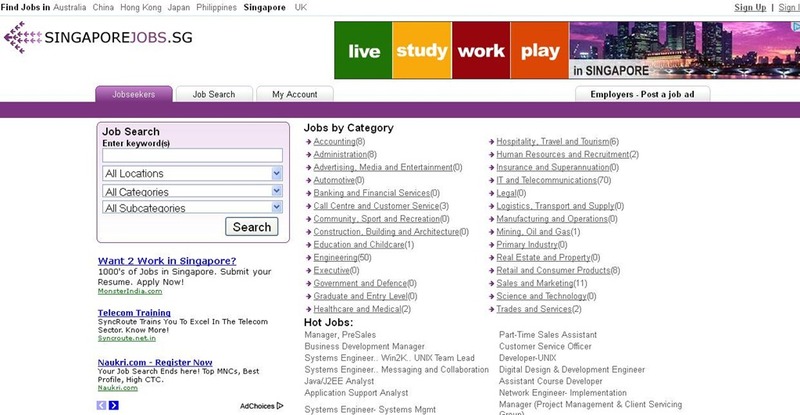 This article covers information about Top Job websites in Singapore. This article provides information about Top Singapore job sites, Singapore Job consultants in India, Top consultancies in India for singapore jobs. Given below is the list of Top job sites in singapore. In these top Job sites, some job sites are for freshers while some are for experienced. 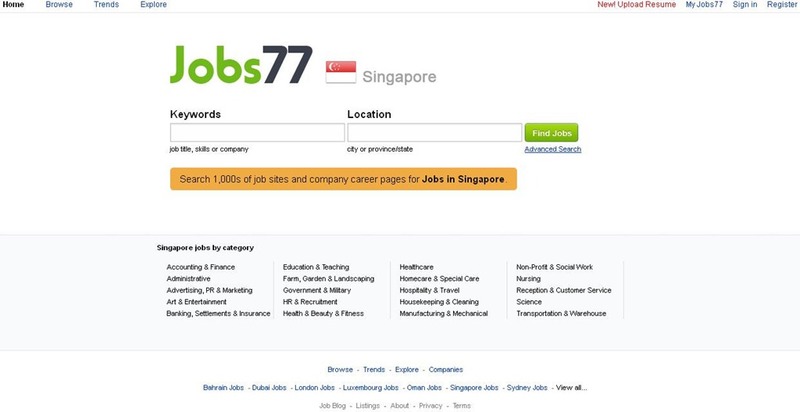 BestJobs is among the most popular website for job seekers of Singapore. The website facilitates free CV upload and allows the user are offered with a free web address for their resume. The website is also very fine for the recruiter. 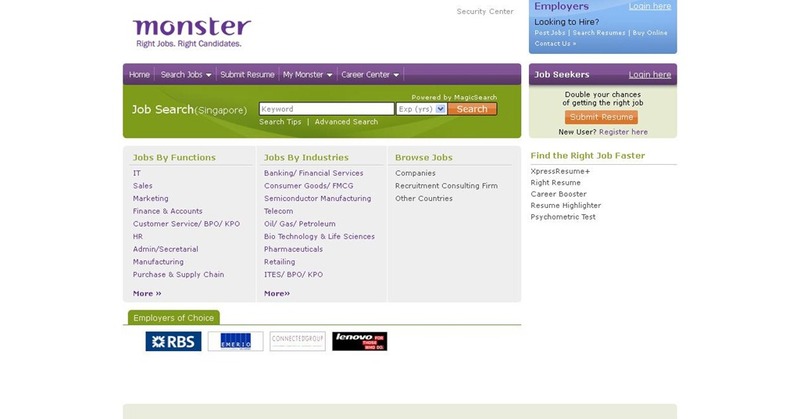 Monster also provides its job offering services to the job seekers of Singapore. It offers jobs in banking, IT and other sectors. The website allows job search on the basic of industry and work experience. 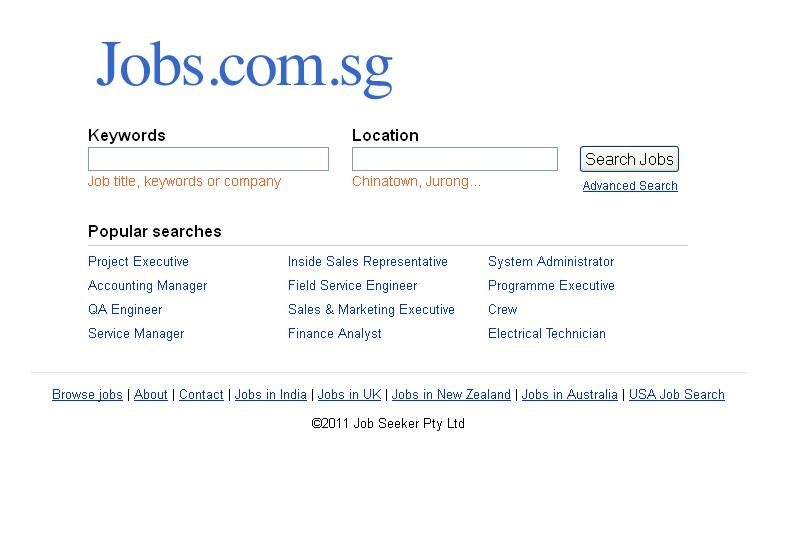 Jobs.com is another famous job searching website of Singapore. The website allows job browsing options on the basis of location and sectors. Like the search engine like Google and yahoo, it displays a long list of jobs from different sites. 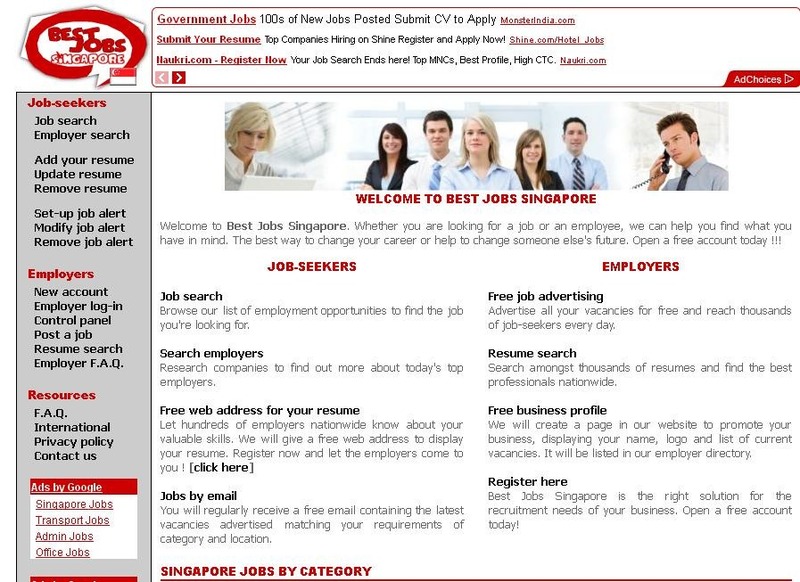 The website is a very popular destination for the job seekers of Singapore. 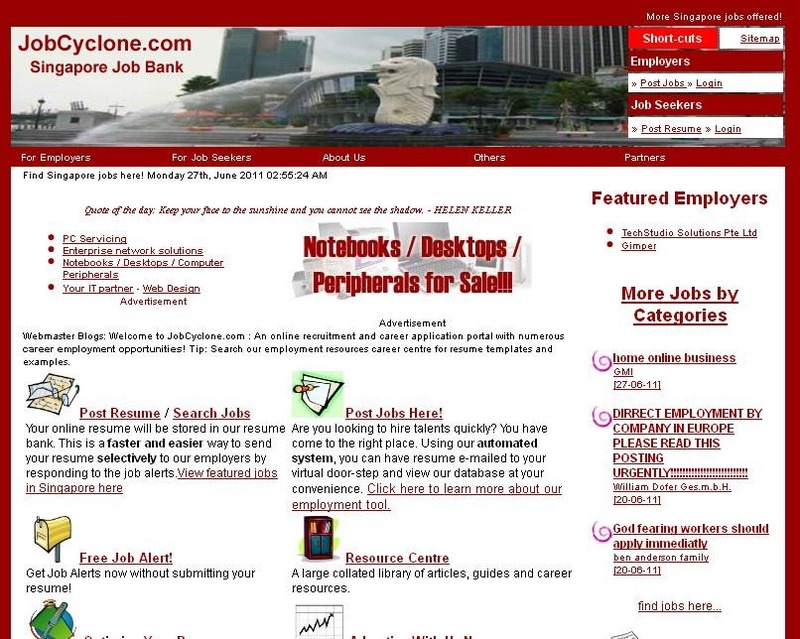 JobCyclone offers free resume posting and job alerts. In addition to this it allows resume optimization without any fees. It also offers job posting for recruiters. It is a very productive employment search engine. 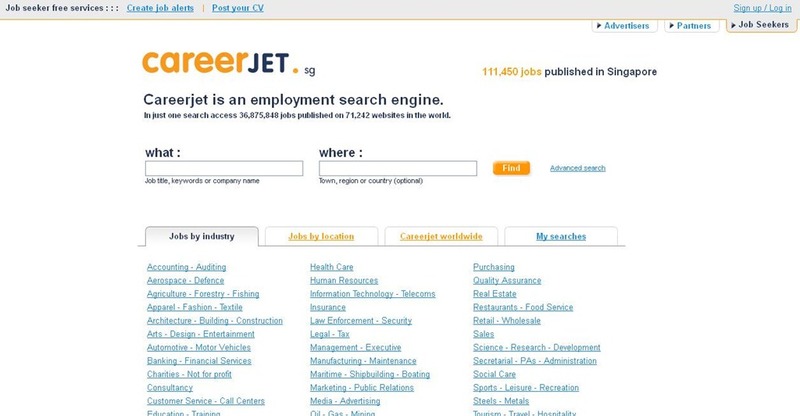 CareerJet, just like search engines like Google and bing, fetches job postings from recruiters website or newspapers and displays the entire list. It offers job in every known industry and location. eFinancialCareers is a very promising job searching website for those job seekers looking for jobs specially in banking and finance. It offers thousands of jobs including hundreds of categories at different locations. It allows job postings for recruiters. 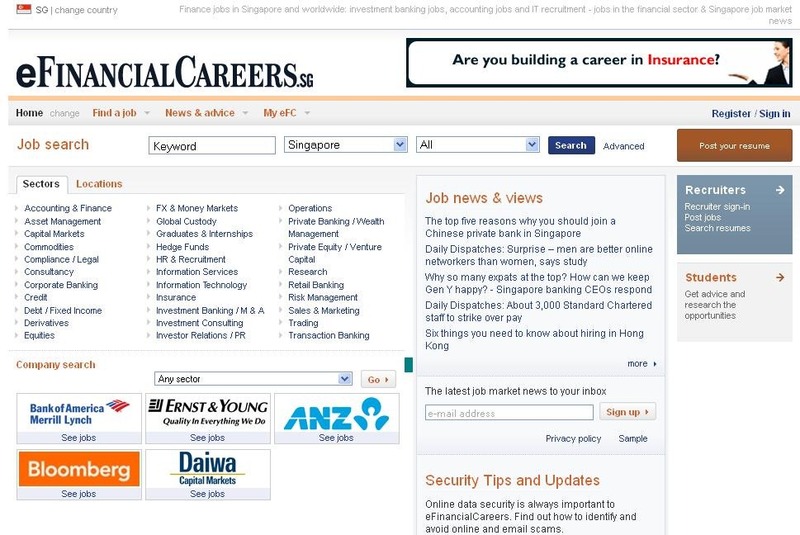 Careers is an employment and job oriented website for the job seekers of Singapore. It is for those looking for jobs in government sector in Singapore. The website provides quick job search and browse jobs on the basis of qualification and industry type. 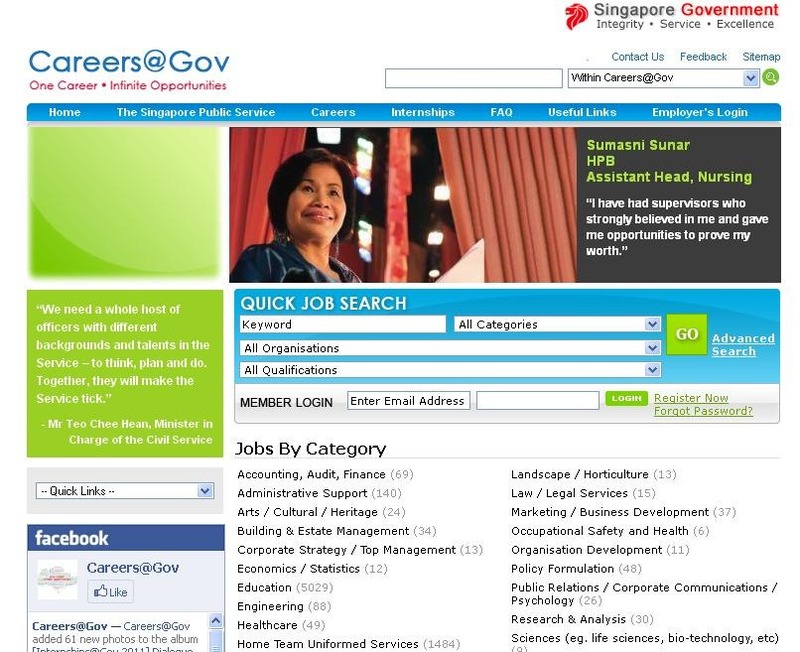 SingaporeJobs is a job searching website for the Singapore job seekers. The website provides job searching based on location, categories and subcategories. It also facilitates the employers to the post the job for finding the suitable candidate. The website is one of the popular job search engine which has been providing job offers to the job seekers over the years. The keyword entered into the box results in browsing of more than 1000 job offers at different. 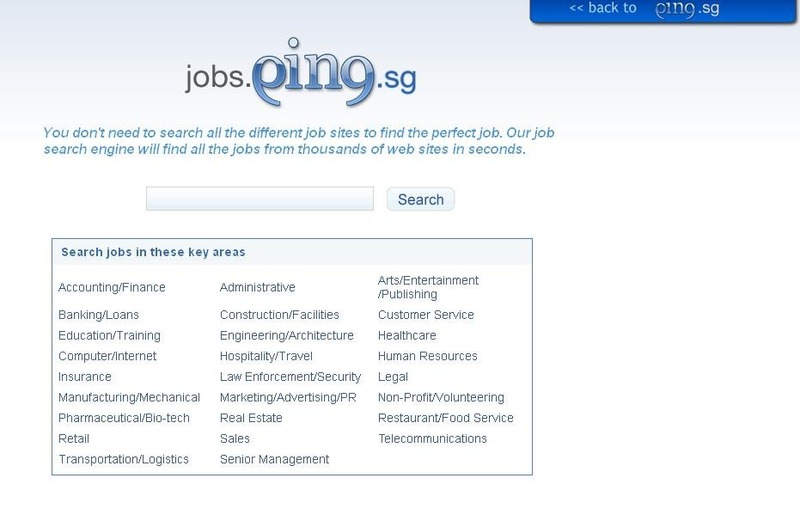 Jobs.Ping is a very simple looking job searching website for Singapore candidates. 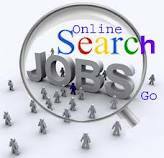 Its search engine brings all the list of job postings matching with keyword entered by the user. It offers jobs in almost every industry and at different locations. If you find this article interesting, browse through some of the other popular articles in Jobs for everyone such as Top Job sites in USA, Top Job sites in Europe, Top Job sites in Finland and Top Job sites in Dubai. If you are looking for some Interview Tips or Career Building Tips, Read the full article on Top Career Building Sites in Web. Still i am working in a maruti suzuki but i will go to other contry. I am form India, I have done MBA in marketing . Now i am looking for job in Singapore , please assist me for any relevant job portal in singapore ,where job are open to all. I am from India<i have done Bachelor in Business Law,And I have ten yrs Exp.in Accounting ,Now I am Looking for a Job in Singapore,Pls guide me for any relevant job portal in Singapore,where I can get job Easily.